ROKiT, a revolutionary telecommunications company, today introduced its line of five mobile handsets, including three smartphones, to market. At an event hosted this morning in downtown Los Angeles, company founders John Paul DeJoria and Jonathan Kendrick announced that the handsets would be officially available for purchase online across the U.S. exclusively at ROKiT.com and Walmart.com starting today. Unlike any other phone brand, ROKiT is shaking up the mobile landscape by pairing its phones with vital life services like family telemedicine, legal counsel, and more. The collection also includes two smartphone models with the best glasses-free 3D technology on the market and a vast library of exclusive 2D and 3D live action and animated content. These unrivaled entertainment and lifestyle packages come packed into premium mobile handsets available at a fraction of the cost of competitors. ROKiT smartphones offer endless entertainment through its ROK Entertainment platform, which includes access to subscription-based streaming television, music, and games. Two of ROKiT’s smartphone models, the ROKiT IO 3D and IO Pro 3D, feature stereoscopic screen technology meticulously crafted to provide a crisp, vibrant 3D image and eliminate previous barriers to 3D’s success. To ensure a seamless experience for users, the phones also enable access to premium, quality-controlled 3D content at the touch of a button through the ROKFLiX 3D app, an expansive catalogue of feature films and custom content created by ROKiT Studios, the company’s 3D and animation studio in France. ROKiT’s life-changing bundles are rooted in providing health and protection for the whole family. ROK Life Services come pre-loaded on select models in ROKiT’S phone range, kicking off with a year’s free access to 24/7 telemedicine and discounted pharmaceuticals, with roadside assistance, family legal services, and accidental death, burial and cremation, and identity theft insurance available at low-cost monthly rates. All five sleek black handsets are unlocked, equipped with the latest Android features available, and include Dual Sim, WiFi calling, WhatsApp, Facebook, Bluetooth, FM Radio, and MP3 as standard. 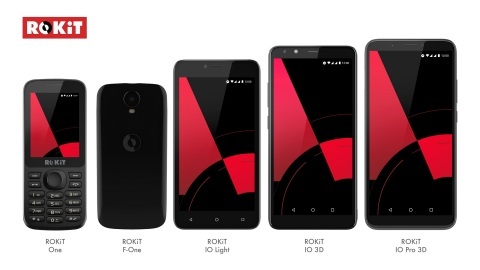 ROKiT phones are available to purchase in the U.S. at ROKiT.com and Walmart.com and will be rolling out to the UK next month via Amazon.co.uk. ROK Brands was founded by seasoned business innovators John Paul DeJoria and Jonathan Kendrick. The corporation includes ROK Vision, ROK Drinks (ABK Beer, Real Irish Whiskey, Bogart’s Spirits, among others), ROK Water, ROK Stars, ROK Books and other brands. Headquartered in the United Kingdom and Southern California, ROK Brands offers a diverse portfolio of products that improve the lifestyle of mankind around the world. Additional information can be found at www.rokbrands.com.